I’ve been working on restoring a 1941 Ludwig Top Hat and Cane “Swing Sensation” set for the last couple of years. Good things take time. This is definitely a good thing and DEFINITELY taking some time! For those of you who are not familiar with this set the Ludwig Top Hat and Cane set was a special edition set available in 1940 and 41. It was basically the same as their regular “Swing Sensation” outfit but was unique in it’s art deco top,hat, gloves and cane pattern superimposed over the regular white marine pearl finish. It was the absolute pinnacle of the drum industry at the time. The best that money could buy. Very few were ever made and only about 15 of these sets are known to still exist today. By some strange twist of fate 6 of these sets have come my way. I sold one to U2 producer Daniel Lanois, one to Charlie Watts of the Rolling Stones and one to actor Johnny Depp. I still own 3 of these sets. This set includes a 26″ bass, 11, 13 and 16″ toms and a 7×14 snare drum. The set actually began as 2 sets. I got the bass and snare from one party and the toms from another. Fortunately they all match perfectly. The toms came from the daughter of a mid-western drummer named Henry “Hank” Andrew Leja who had recently passed away. I purchased them from her about a year ago. Initially she was only able to locate the 13 and 16″ toms. 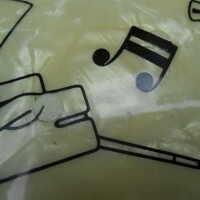 I was thrilled when she contacted me earlier this summer and informed me she had found the missing 11″ tom. The bass and snare came from a store also in the mid-west that had had them in stock for many years. Although all of the drums were in extremely nice condition for thier age, each of them had had some sort of modification that needed to be restored to it’s original condition. All the drums needed a good cleaning and polishing. 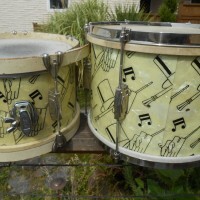 I sent the set to drum restoration artist Jack Lawton. He masterfully filled extra holes and buffed and polished the shells and hardware. It took a long time but he did an amazing job. You cab see in the photos how he finished the repaired holes with matching pieces of vintage wrap and in some cases artfully re-created the drilled through Top Hat pattern by hand. 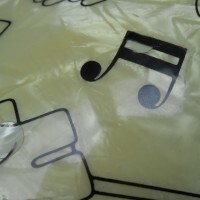 I just received the missing 11″ tom and sent it to Matt Sinyard of the Bonzo Drum Company to be restored. 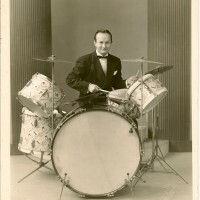 You can also see in the original photo from the 1940s the hoops on the 11 and 16 toms are wood and the 13″ tom is metal. I had never seen a Top Hat set with wooden hoops. How or why this set ended up with a combination of wood and metal hoops is anyone’s guess. I figure it was just yet another Ludwig anomaly. They were probably out of metal hoops the day they finished the set and so they used whatever was available at the time. I plan to put wood hoops on all of the toms so they match. I’m still hunting for a pair of era correct 13″ wooden hoops and a set of nickel claws and rods. Anyone have some ?? I expect to have the 11″ tom restored before too long. That will be the final piece in restoring this set to it’s original magnificent condition. I will definitely post photos of the set once it’s complete. Watch for updates and please let me know if you can help me with any of the parts I still need. The set will be for sale once it’s complete. I don’t know the price yet. I’m going to wait until it’s complete before I even start thinking about that. Enjoy! !